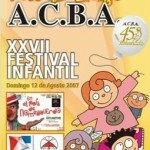 On Sunday August 12, Children’s Day Festival was held in Buenos Aires. 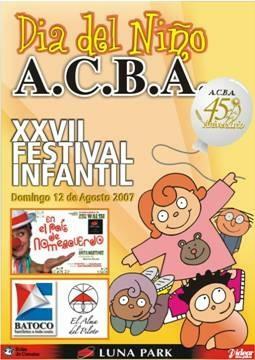 The “Asociación Cerealista de Buenos Aires” – A.C.B.A – invited BaToCo Club to celebrate the “XXVII Children’s Day Festival” at Luna Park Stadium. It was a great show and this time our demonstration was held on the main stage, included in the official schedule. 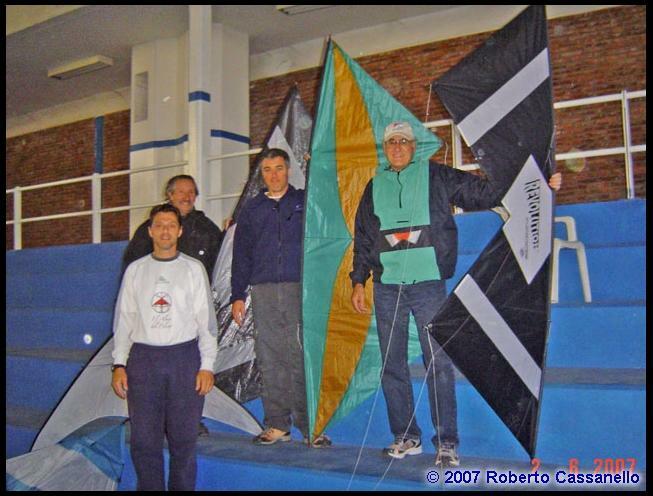 As you know, BaToCo Kite Club is the most important and representative argentine non-profit Kites Organization not only for encouraging people to practice kite flying as sport, but because the support it brings to social activities. That’s why, this time supported Dr. Ruben Sosa’s proposal to avoid “Children home accident”. 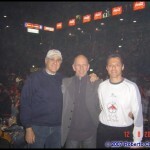 A huge number of spectators were present, 8.000. This year the amount increased in 23%, compared with the previous XXVI Festival edition. Wow! “The Country of I do not remember” Show. 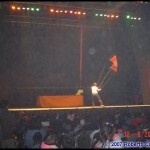 “Murga de Belgrano” – Show. The organizers gave us a warm breakfast welcome shared with friends. 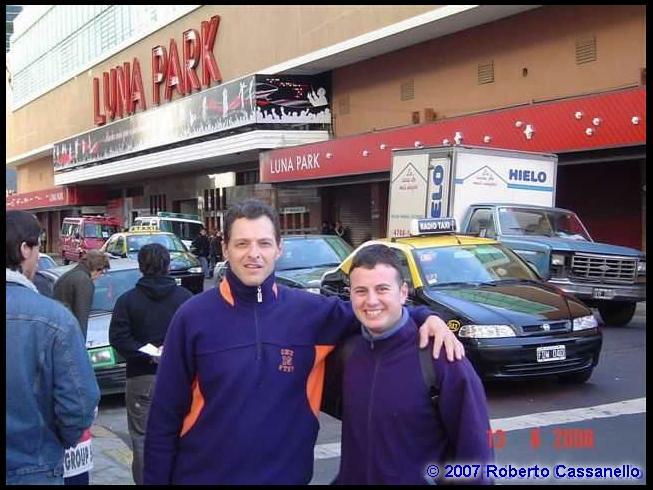 I would like to give special thanks to my friend Raul Luoni – President of “Asociación Ceralista de Buenos Aires to invite our BaToCo Club to such an important event. 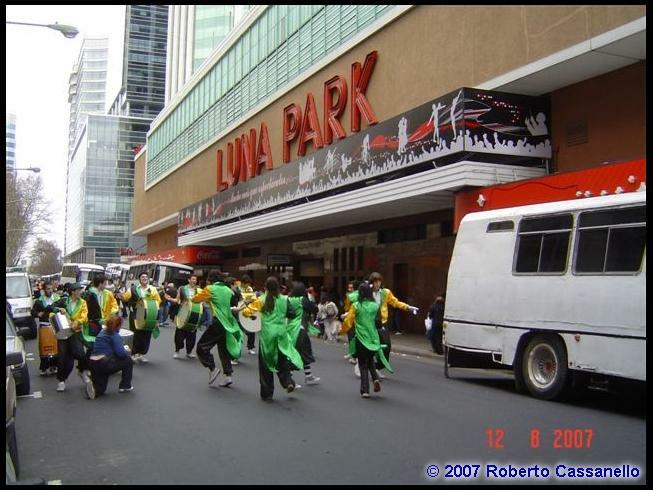 About 9:00 AM the children begun to arrived from different places to the Luna Park Stadium. Teachers, parents and members of the “Asociación” welcome the children with a bag of candies, toys and juices. Slowly, a happy atmosphere came over the Stadium. 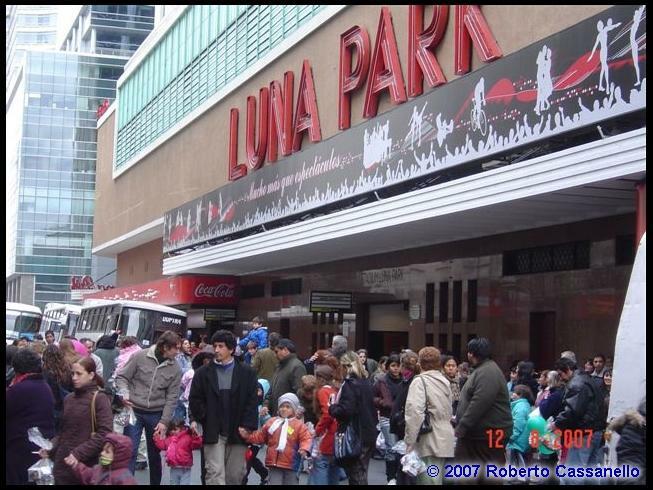 It is astonishing to see the “Luna Park” full of children expecting for the show. You can hear shouts, laughs, claps, watch smile faces, jumps, and some children running along the corridors. BaToCo members were present giving brochures, putting banners and helping me and Roberto Cassanello to set our kites. 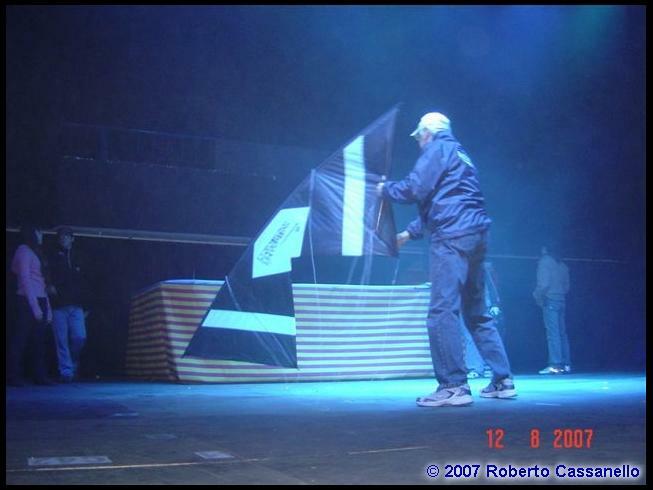 Because, this opportunity, Roberto was my kite – mate. The show begun with School of Arms Band – “Field of May”. 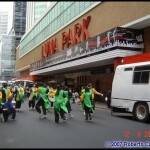 They entered at the Stadium marching in time of their song. People said welcome with a huge applause. Suddenly lined on the stage to play our National Anthem and then played others songs and marches from their repertoire that were well known by the audience. It was a touching and funny time. Our charismatic friend “Ruben” works very hard for children to avoid any health damage. This time, a particularly advices were given to them to avoid “Accidents at home”. The advices were given mostly to children on a little ages. Their parents have to take special care with newborn to 5 years old, he said. Also he add a particularly advice about AIDs prevention, drugs and cigarettes consumption for greatest children and their parents too. “Not to drugs, Not to smoke and YES to life”. 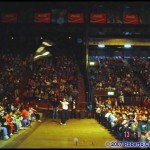 We prepared two routines demonstrations, Single and Pares that it was announced by the speaker. 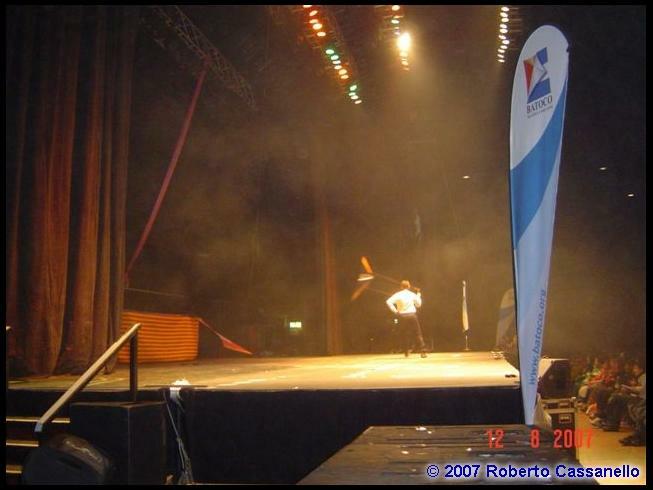 By the way I would like to say that 2 years ago nobody flew windless indoor / outdoor in Argentina. 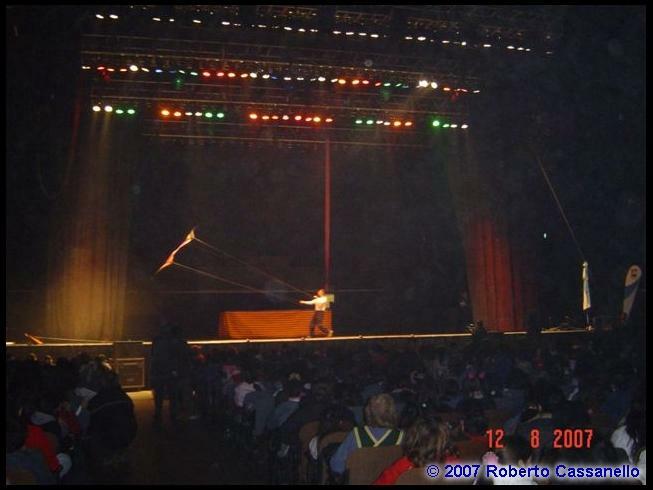 Remember that last year Gabriel Acosta and me flew single Quad and Dual at XXVI Children Day Festival, after that John Barresi did a workshop in Comodoro Rivadavia – Chubut Province – December 2006. This year I had the luck to teach some people who were interested to learn windless Revolution. 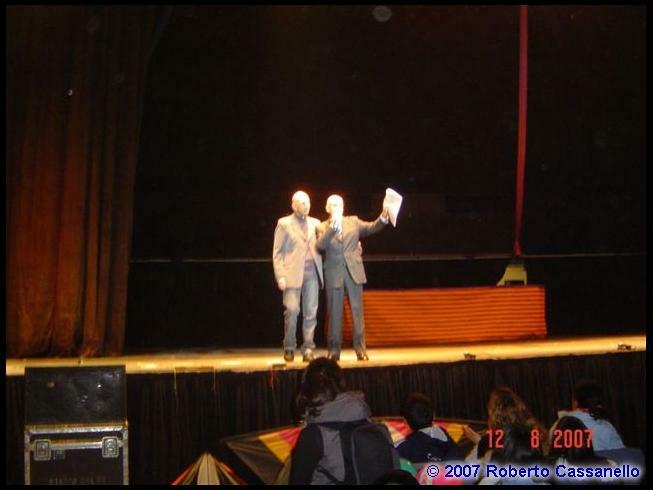 Nowadays we are 5, Mrs: Roberto Cassanello, Héctor Cesaretti, Pablo Macchiavello, Gabriel and me. 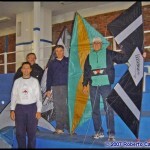 My kite-mate Roberto Cassanello learned very fast to fly windless indoor quad lines. It is incredible the improvement this guy made. 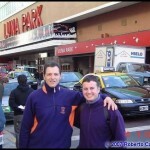 The formula: persistence and tenacity…So, Roberto Keep on going! That’s why we decided to fly in pairs windless at the “Luna”. However I begin by telling you that we could not and we felt a little disappointment for that. Maybe you are wondering why? 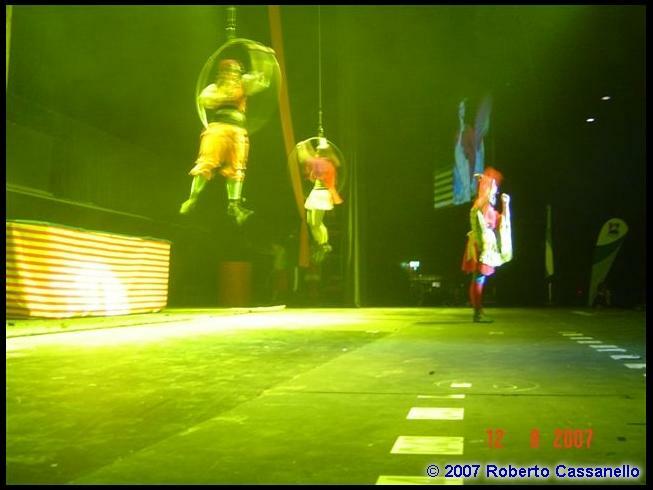 Because there was not enough place to fly on the stage… And what about the corridor like last year? 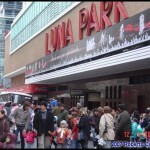 Impossible, – Luna Park place was full. So, what we did? 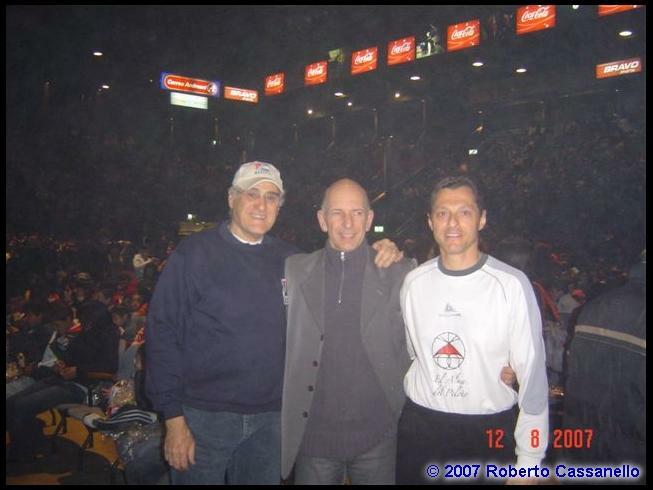 Well, Roberto told me, do not worry my friend, next time; you will have to do a single demo. 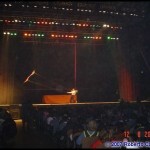 Therefore for a single demo, on the spot, I thought to do a mix of Revolution and Windless Multiple Kite dual line. But enough place for “Multiple” on the stage too. 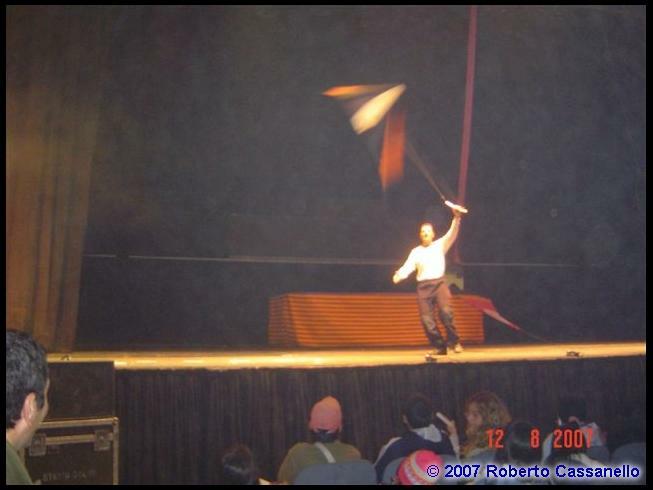 Eventually Roberto told me: perform the routine called “The Flight of Condor” with Revolution + “Y2” on a one hand. and I did it. Watch the video on by clicking here! 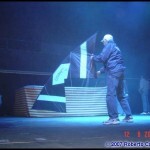 I would like to explain that Gabriel Acosta particularly designed “Y2″by for Multiple Kite Windless Indoor. 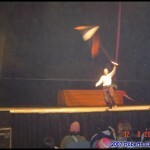 Is a good kite to me and on next article I am going to share my experience about it. The music exploded and I begun to fly my demo. At the very beginning the crowd was in silence watching my imaginary “Condor” quad flying; but when the music change the rhythm I changed for a little “Condor” and people clapped in time of music. 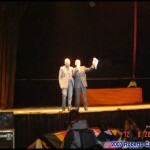 That time was marvelous for me, the audience gave me a warmly applause at the end of demo. 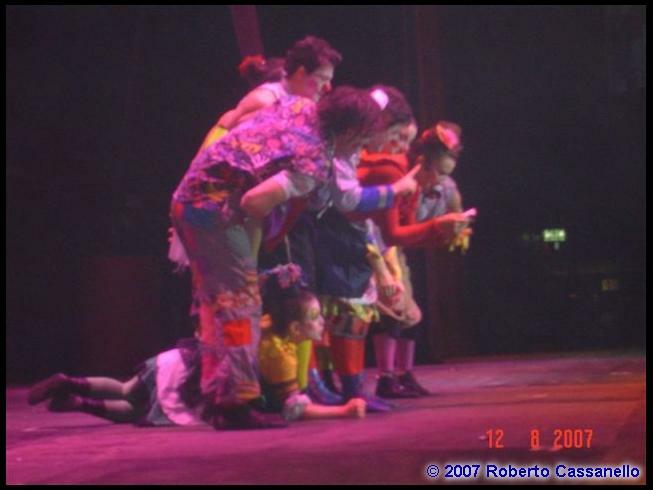 The show is about Maria Elena Walsh songs, a famous Argentine musician and writer for children. 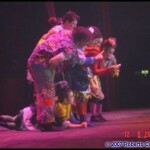 The show mixed Maria’s songs and choreography accordingly with the letters of songs. 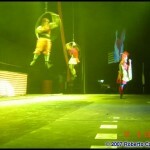 There were clowns, acrobats, jugglers and trapezes. Who is Maria Elena Walsh? Born on February 1, 1930 in Ramos Mejia – Buenos Aires, she is an Argentine musician and writer known for her songs and books for children. At the year of 15, María Elena had already published some poems in the “El Hogar” magazine and “La Nación” newspaper. Two years later, she wrote her first book of poems; “Otoño Imperdonable” (“Unforgivable Autumn”). In 1948, she started travelling invited by Mr. Juan Ramon Jiménez, to the United States and in 1952 visited Europe staying in Paris for 4 years. From there, spread Argentine folklore concerts with Leda Valladares, her partner, to a French people. 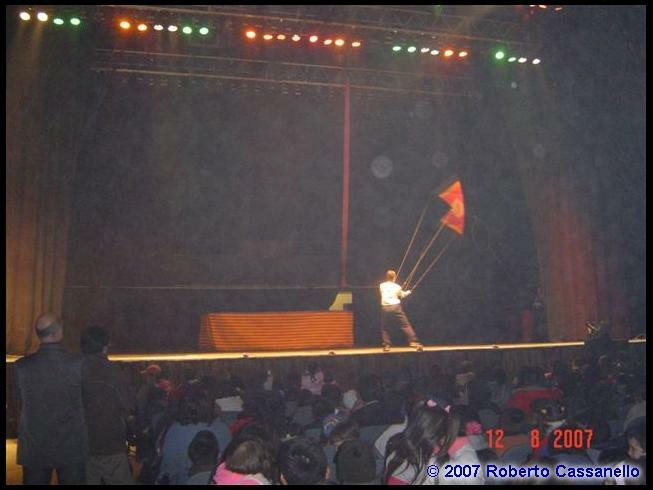 From 1959 wrote TV and theatre scripts, plays, poems and songs for children that have been song by generations of Argentine. Her books and songs, like “Como la cigarra” (“Like the cicada”) often have strong political connotations, as even some of her work aimed to children has, such as “El Reino del Reves” (“The Kingdom of Upside-Down”), and “El Pais del Nomeacuerdo” (“The Country of I do not remember”). “El Pais del Nomeacuerdo” (The Country of I do not remember) was used as the main song of political-film “The Official Story” directed by Luis Puenzo. This picture won the Best Foreign film Oscar Award given by the Hollywood Academy. 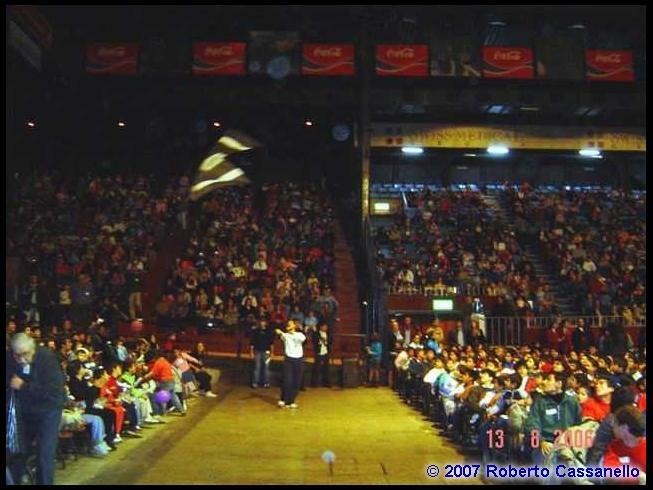 On 1985 she was designed Illustrious Citizen of “Ciudad Autónoma de Buenos Aires” and on 1990 named Phd. Honoris Causa de la Ciudad de Córdoba – Córdoba Province. Argentina Ballet is integrated by native people who spread our cultural traditions through dance. 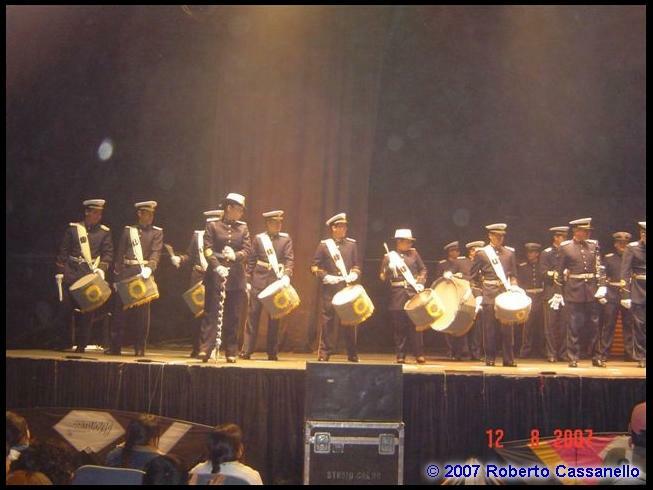 Their repertoire includes all types natives folk rhythms like: “zamba, cueca, gato, bailecito” and others. 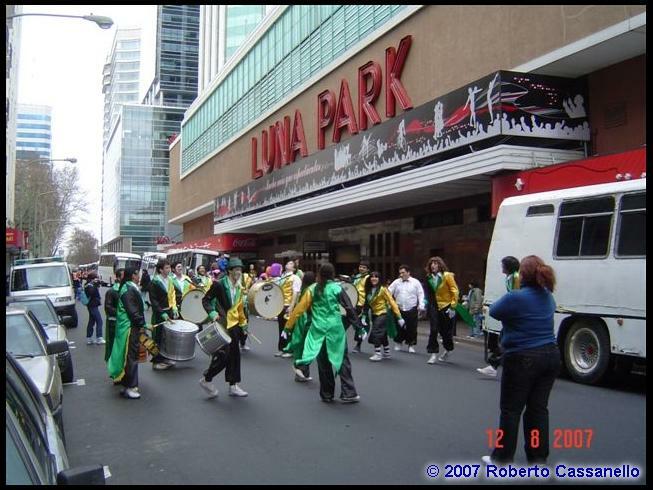 The ballet danced in time of music and played drums, using “boleadoras” too, that recreated our traditions. 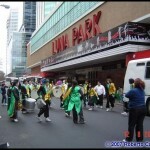 The “Murga” is a kind of music developed on Carnivals of Century XIX. The main rhythms are basically from Africa. 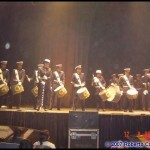 The songs are played by big and different types of drums. Mainly the “Murga” played their instruments dancing on the streets and sometimes on stages. The target of “Murga” is making people dance with them. The dancers could be 20 to 400 wearing colorful clothes, similar wears in the Carnivals of Century XIX. Thanks Kitelife for the opportunity to publish my article. 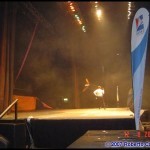 This entry was posted in 2007, General Topics, Indoor Kiting, Issue 56 (Sep/Oct), KL Archive and tagged festival, indoor, rev.